Thickets, borders of forests and swamps; dry prairie-like ground and jack pine plains; roadsides, fencerows, fields. Most plants are the glabrous var. dodgei, including those with the fruit yellowish rather than red. Plants with the inflorescences and to some extent the upper leaf surface loosely villous are var. lumaria (Ashe) Sarg. MICHIGAN FLORA ONLINE. A. A. Reznicek, E. G. Voss, & B. S. Walters. February 2011. University of Michigan. Web. 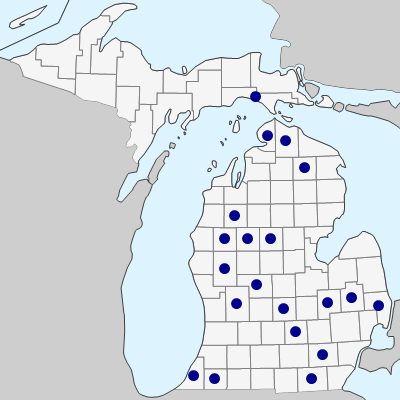 April 21, 2019. https://michiganflora.net/species.aspx?id=2445.